Chocolate, Vanilla, Strawberry, Café Latte and Greenberry Shakeology include whey protein isolate, an easily absorbable source of high-quality protein that’s ideal for building and maintaining lean muscle mass. Tropical Strawberry and Vegan Chocolate include high-quality plant proteins from brown rice, pea and other sources. Essential amino acids, found in these proteins, help the body repair muscle tissue and heal wounds; and reduce hunger pangs. The protein in all Shakeology products provides a highly bioavailable source of essential amino acids. Shakeology contains many ingredients that are beneficial to the digestive system. Adaptogens are special herbs that grow in harsh climates and conditions, at high elevations, atop mountains where the soil is rocky and oxygen in the air is thin. Because these plants have to adapt to harsh conditions, they have highly concentrated nutrients that can help your body cope with stress, provide energy, and maintain a strong immune system. 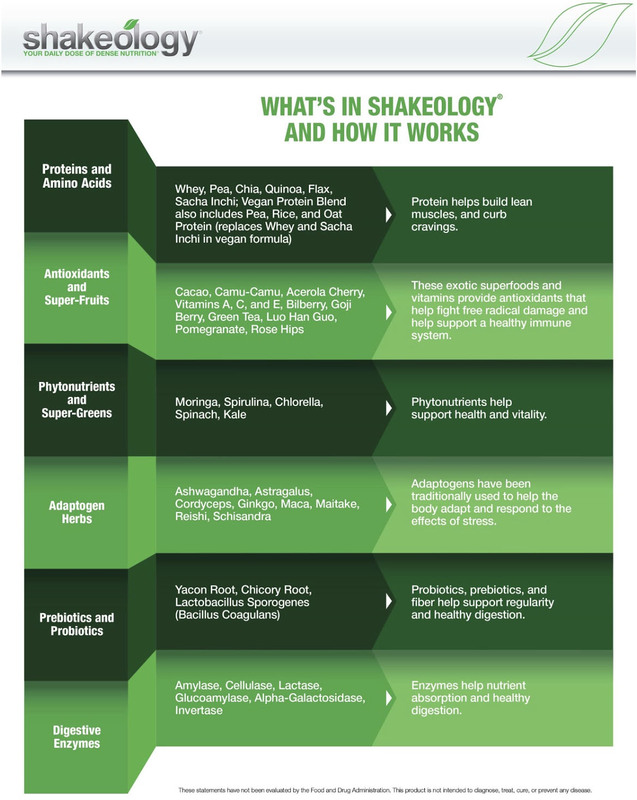 Shakeology has a total of 9 adaptogens – more than any other shake out there. Many of Shakeology’s fruit and vegetable sources have been chosen for their high concentration of healthy natural substances known as phytonutrients, including flavonoids, polyphenols, anthocyanins, and catechins. These substances have antioxidant properties, meaning they help neutralize molecules known as free radicals, which damage cells and may contribute to the aging process. In laboratory tests, phytonutrients have shown promise in helping prevent a wide variety of degenerative conditions. Most of us don’t get the complete range of essential vitamins and minerals in our daily diets. Some important vitamins, such as vitamin B and C vitamins, are water-soluble, meaning they’re flushed out of your body after a short time and need to be replenished regularly. Others, like vitamin E, can be difficult to get enough of in food. Shakeology Chocolate, Strawberry, Vanilla and Greenberry provide all these nutrients in an easy-to-take form, so you never have to worry. Take the first step toward improving your health by trying Shakeology for the next 30 days. If you don’t feel healthier, more energized, and simply amazing, you won’t pay. 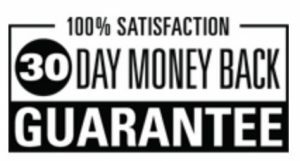 If you’re not completely satisfied, simply call Customer Service within 30 days for a refund of the purchase price, less s&h— even if your bag is totally empty! Even though I call these “everyday ingredients”, they are still hard to understand. You may have seen these before in other foods, but here is what they do and why they are important for your health. Folic Acid (50% of DV): This ingredient can also be referred to as Vitamin M or B9. Folic acid has many benefits including: Stroke reduction, Sperm Quality (in males, helps reduce chromosomal defects in sperm), Macular Degeneration (In Fact, a study was completed where women have reduced potential for degeneration by 34.7%). Pantothenic acid (50% of DV): This ingredient (Vitamin B5) helps with oxygen utilization efficiency. What does that mean? It helps fuel oxygen to your muscles, which reduces muscle soreness and aches. Phosphorous (25% of DV): Having this ingredient daily can help strengthen tooth enamel. This leads to stronger teeth and prevention of early tooth decay. Iodine (35% of DV): This ingredient is widely known to help with your thyroid. But not only that, iodine is beneficial for breast, stomach, brain, and other important tissues. Not having enough (or having TOO much) can cause problems for vital tissues. Magnesium (20% of DV): magnesium helps regulates blood sugar, and keeps heart rhythm running, strong bones, and your immune system in check. Copper (40% of DV): not having enough copper in your diet can lead towards deficiencies such as osteoporosis, infections, and glucose problems. Copper ingested into your liver and spreads through your bloodstream to regulate your blood sugar and benefit your bones and glucose levels significantly. Manganese (100% of DV): a beautiful ingredient that helps your body properly digest and use the other ingredients like zinc, copper, and iron better. Not only that, there have been studies that show that manganese can help treat things like: epilepsy, asthma, diabetes, Schizophrenics, Rheumatoid arthritis, Multiple sclerosis, heart disease, and more. A powerful ingredient that gives you 100% DV in one serving of Shakeology. Chromium (50% of DV): Chromium enhances the production of insulin in your body. Insulin helps with the metabolism and storage of carbohydrates, fats, and proteins in your body. This in turn can help regulate potential for diabetes and speed up that metabolism a bit. Molybdenum (40% of DV): Similar to phosphorus, this ingredient helps strengthen tooth enamel and helps prevent tooth decay. Smile my friends, it’s a helpful ingredient to have in your diet!